This is Chris Goff, co-founder of the REI Pro software, and in this training session, I want to go over the different types of investing strategies, along with the pros and cons of each one. The first thing I want to talk to you about before we go over how to invest with each strategy is how we actually acquire these properties. I'm shocked that other experts don't teach you this. Knowledge about the three financing techniques is essential, prior to even learning a strategy. *The first one is what called ‘All Cash’. Any time I refer to paying cash for a property, I'm not talking about pulling the total sales price in cash out of your wallet or even your personal bank account. All this means is that we're going pay the seller in one lump sum. Keep in mind here that when paying ‘All-Cash’, you need to get it at a discount (below CURRENT appraisal), otherwise you would have paid full price and that’s harder to turn into profit. *The second is called ‘Terms’. This is made up of a percentage of the total price paid up front, aka ‘down payment’, a set payment made every month, and the determined length of time payments should be made before payoff. Now, this is probably a familiar structure because you are most likely already doing it if you have financed a car or a home through a bank. You provide a down payment and make monthly payments for a certain amount of time until it’s paid off. *The third and most ideal way to buy property is ‘Discount and Terms’. As it sounds, this is purchasing property at a discounted sales price and paying with set terms. These the three financing techniques are interchangeable, making it possible to structure financing tailor fit for each situation. Now, on to strategies. There are Five. No matter if you put a fancy name on them and dress them up, there are just five. Yes, that’s it. I’ll explain… if you purchased a property for investment purposes, how could you make money after buying it? The first thing you could do is rent the property out. You can fix up the property and sell it. You could lease option the property. You could seller finance it, and my question to you is, what else can you do with this property besides living in it or burning it down? There are no other possible solutions and that's why I want to cover these five strategies with you. The Quick-Turn business of locating properties (usually needing repairs) at bargain prices and quickly passing them to investors/landlords at prices well below retail. The Quick-Turn business of locating and rehabbing houses in need of repairs. The homes are then sold to new qualified buyers at retail prices. The Quick-Turn business of creating financing to purchase properties. This allows you to sell acting as the bank, receiving monthly payments, without the use of any lending institution involved in the transaction. The Quick-Turn business of controlling properties with no cash, credit, or a license. A lease-option buyer leases a property and has the right or “option” to purchase the property on or before the end of the lease-purchase agreement. An “option” is simply the right to purchase a property under specific terms within a certain time frame. So, how do you decide which of these to use in varying situations? This Real Estate Strategy Chart is a simple way to determine ‘which’ and ‘when’, also showing likely investment payout for each. The next decision you have to make is what strategy(ies) you should be focusing on. If you're in a position where you can get financing or you have cash, maybe retailing a fix and flip or a seller finance setup might be where you would like to start. Many folks dream of rehabbing a property for profit, and both of these strategies have traditionally high return rates. If you prefer to start off a little slower, any of the others are a great way to ‘get your feet wet’, so to speak. If you fall in the category of the vast majority, you have little or no money to start with. Maybe you have money but bad credit and you can’t get traditional financing. 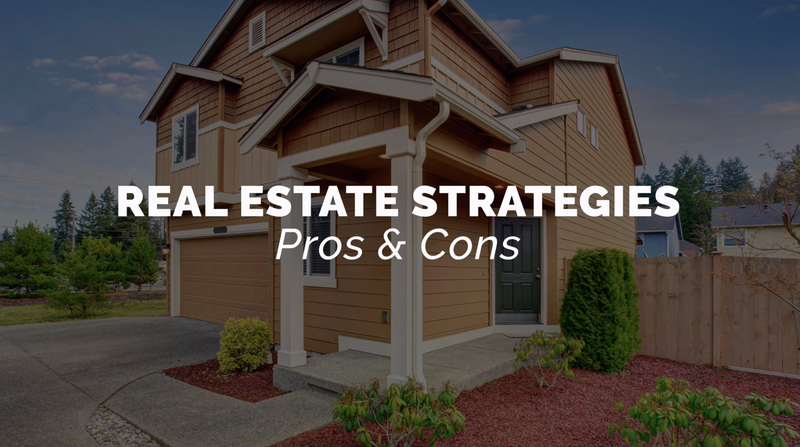 In these cases, starting off with the wholesaling or lease option strategies will be a great way to earn extra cash, establish a reputation in your local REI world, and set you on the path leading to larger scale investing. I think it helps to break down and decide which strategies you would start with but at the end of the day, as you build your career in this business, I want you to be great at all of these strategies. I want you to be comfortable and knowledgeable enough that you can get in front of a seller and no matter what problem they present, you have a solution. That's really the key to successful real estate investing and a very rewarding feeling to be able to help others in difficult situations. I hope this training was insightful and helped answer a few important questions. As always, thank you for being a part of the REIPro family. You are at the heart of building this community and changing the face of real estate investing. Knowing how to invest the right way and having the best tools for the job are the keys to achieving this and reaching your goals, so at REIPro we work hard to put the best software tools in your hands and provide the knowledge to use them. I recommend becoming as familiar as possible with these three financing techniques and five strategies by reviewing the information above and printing a hard copy of the strategy chart for easy reference. I look forward to seeing you attend the next training session… until then, good luck in your real estate investing career!